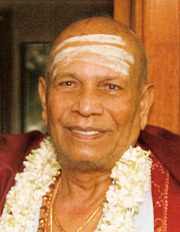 The month of July celebrates the father of Ashtanga Yoga, Sri K. Pattabhi Jois’ birthday. All of us from Inner Path would like to honor his teachings, which were instrumental in bringing yoga to the West in 1975. Jois developed a set of 240 postures in six successive series and called the practice Ashtanga Yoga. The six series of postures are mastered sequentially. The primary series is called yoga chikitsa (therapy) with 75 postures. The intermediate set, nadi shodana (nerve purification), comes next, followed by stira bhaga, which cultivates strength and requires immense endurance. Physical movements called “vinyasas” tie the postures together, while “jump-throughs” connect the vinyasas. The vinyasa resembles the Sun Salutation, which makes the 75 posture set challenging. Each movement is synchronized with ujjaya breathing, a unique, powerful, heating breath in the throat. Practitioners lock their perineal and abdominal muscles (bandhas) in each posture to move vital energy upward in the body. The locks control the breath and directs “prana”, both imperative to keep the body warm. The Jois Ashtanga system is most effective when the body is hot and rigorous from the continuous vinyasa movements. Normally there is no pause in a 90-minute class because the overriding intention is to purify the body through heat. “The practice of asanas and pranayama is learning to control the body and the senses so the inner light may come forth. That light is the same for the whole world and it is possible for man to experience this light, his own Self through correct Yoga practice,” Jois says. Born on July 26, 1915, Pattabhi Jois began to study the Vedas and Hindu rituals at the ripe age of 5. In 1932 Patthabhi Jois discovered his guru, Sri Krishnamacharya, at a university yoga demonstration. A solid relationship ensued for 25 years. Jois was the head of the yoga philosophy department at the Sanskrit College of Mysore from 1937-1973. In 1948, he established the Ashtanga Yoga Research Institute in Mysore, India which became training grounds for yoga teachers from the West. He made his first tour through America in 1975 at the age of 60 and returned 15 times. For the ensuing 20 years, word of Jois and Ashtanga Yoga spread internationally and an increasing number of students flocked to his Mysore yogashala and highly regarded ayurvedic clinic. Jois passed away at home in Mysore on May 18, 2009 at the age of 93. His entire life was devoted to the disciplined practice of Ashtanga Yoga, the development and mastery of the Yoga Korunta system, and his faith and enthusiasm of Sri Krishnamacharya’s teachings.